The SEDEX MODEL FP combines simplicity, reliability and robustness. SEDEX FP occupies only 10 linear inches of bench space. 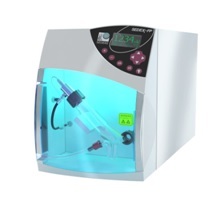 It offers cost effective solution in LC-ELSD for purification by HPLC, SFC, and Flash chromatography. SEDEX FP is mounted with an external splitter to detect and monitor fraction collection. Full SOP protocols are provided for GLP compliance and validation procedures. The nebulizer has a flow rate range from 100µL/min to 5mL/min.